Available for applications received by Wednesday 31 May 2017 and settle on or before Monday 31 July 2017 to be eligible for the $1500 cashback offer. 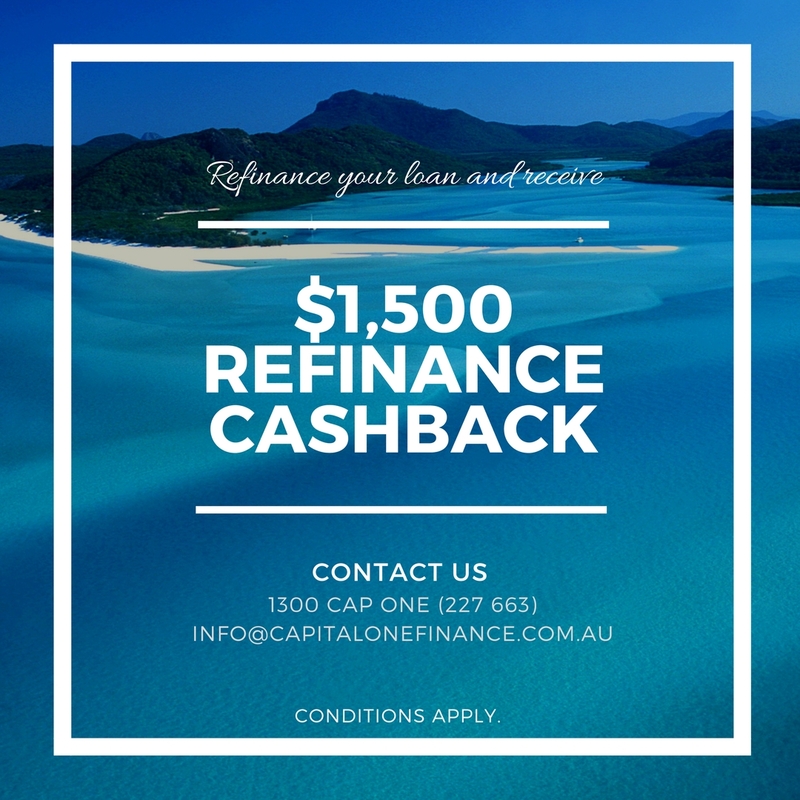 CONTACT US ON 1300 CAP ONE (227 663) or email info@capitalonefinance.com.au. Available on applications from Monday 23 January 2017 to Wednesday 31 May 2017. Must settle by Monday 31 July 2017. Cashback offer for refinances only. Available for Owner Occupier (principal & interest repayments only) and Residential Investment home loans. Home loans under Advantage Package only. The loan amount on the single home loan application for refinances must be $250,000 or more. One cashback per loan application, paid to the main applicant (Applicant 1) during the campaign period only (multiple applications submitted by the same main applicant are not eligible for this offer). Applicants must have a St.George transaction account linked to the home loan at the time of settlement. Applicants’ home loan repayments must be direct debited from this St.George transaction account. The linked St.George transaction account must be kept open for at least 60 days after settlement to be eligible for the cashback. Refinances of existing Westpac, St.George, BankSA, Bank of Melbourne and RAMS home loans. Loans not on an Advantage package. Applications received outside of the campaign period. This offer is not available in conjunction with any other cashback, rebate or LMI campaign offers. Refinances into Owner Occupier Interest Only loans.